The Employee Verification is an essential aspect, once the candidate gets selected. 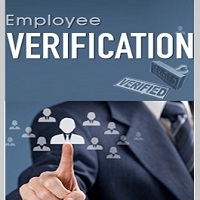 We, at AARNA CONSULTANCY, have specialized in providing Employee Verification services for the hiring companies. We do Employee Verification on the basis of family background, qualifications, criminal records, about their previous employer and authenticity of the documents submitted by them. For the Employee Verification service, we have employed a team of experts which are well-experienced in their field and leave no stone unturned in the proper verification of the employee but this is a paid service.